With the coming release of Dawn of War II: Retribution; I’ve decided to replay all the Dawn of War Campaigns from the very beginning. I wanted to see the story of the Blood Ravens as it unfolds in the video games. This is the story as it appears on my computer screen, and in no relation is affected by any of the novelizations. 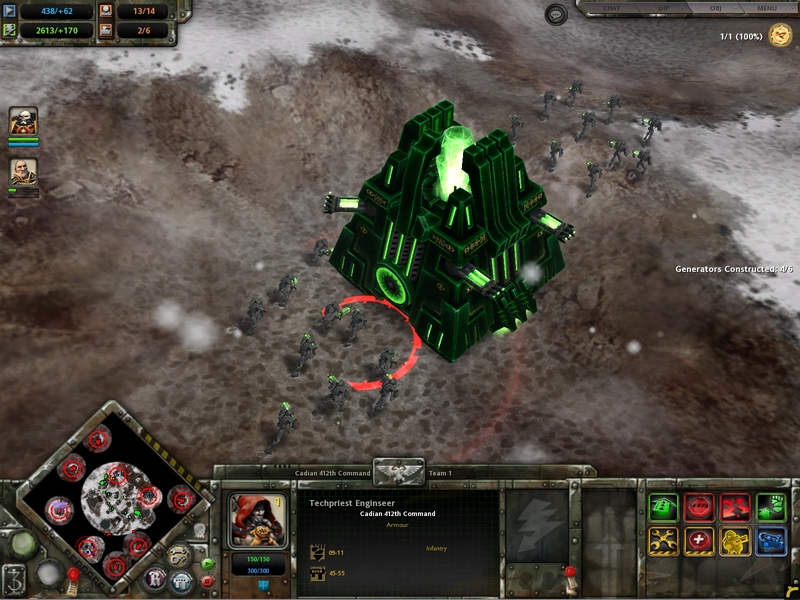 After completing the first Dawn of War game, next on the list was the Winter Assault expansion. This is actually the second attempt at writing this review. My first draft was incredibly harsh. So harsh, in fact, that I tabled my review, and thought about why I wasn’t happy with it. A couple things came to mind. Winter Assault bridges Dawn of War and Dark Crusade. It’s an expansion, and yet the new race it introduced wasn’t new. The Imperial Guard were a key player in the Dawn of War campaign, but weren’t a playable race in multiplayer. The campaign is again story based, and while I enjoyed the story and the built in replayability (you can play from either the side of Order or Disorder, and the finale can be played specific to the four main races: IG, Eldar, Chaos, and Orks), it works better as a segue between Dawn of War and Dark Crusade than as a standalone story. It introduces characters who we will see again in Dark Crusade, as well as the big reveal of Necrons. Also, the story has no Blood Ravens. What little Space Marine action we get is of the Ultramarines variety. 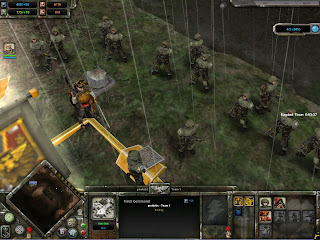 They play the role the IG played in Dawn of War, interested ally whom we interact with and help. We're Imperial Guardsmen, even the rain hurts us. The campaign breaks down what happens on Lorn V as the factions fight to either control an Imperial Titan, or in the case of the Eldar to stem the coming Necron invasion. Each side gets 5 missions. The first four missions are split between each side’s races, and the final mission early on splits time before the player has to choose which faction to play through the end. And while both the Order and Disorder campaigns cover the same basic time frame, they are substantially different in scope and feel. Order focuses on the Imperial Guard fighting to get a beachhead on Lorn V and then capture the Titan. They assist or assisted by the Ultramarines who are transporting the Titan crew. The Eldar assist the IG secretly until they face being overrun by the Orks when they require the IG assist them. They then carry an uneasy alliance until the final mission. Disorder focuses on the rise of Warboss Gorgutz’s Waagh!, both his fight to unify the Orks and then his battle with the forces of Chaos under the command of Lord Crull. Only when the Imperial Guard land do they set aside their differences until the Titan is in site and then turn on each other again. Same basic structure, same objective, but where one succeeds, the other kind of fails. The Disorder is a lot more fun. The Orks bring their mix of brutality and humor into the game, and the Chaos Marines are just diabolical and wicked (nothing like seeing Imperial Guardsmen popping into a cloud of dust as they sacrificed to Khorne). The Eldar are not my race of choice to play in either 40K or in Dawn of War, and while I love the Imperial Guard their over-the-top micromanagement makes the Order campaign less a game, and more a chore. Really if it wasn’t for the final mission, I would have actually disliked the Order campaign. But suddenly I was in control of the Titan guns, the Necrons were coming, and I was taking out Monoliths with two shots. That was such a fun mission it actually made up for the seemingly joyless click-fest that was the rest of the campaign. It made it all worthwhile. For the Disorder side, it was just icing on an already fun cake. And really, that’s a shame. Because I played a round of multiplayer as the Imperial Guard and they were fun. Maybe it was because I knew to expect the micro-management, but I suspect it was because I was managing to complete an objective, not to get to the next trigger to move on in the story. The objective is never lost, but the story does get lost in all the clicking. In the end, Winter Assault works best when viewed as less an expansion, and more like the DLC we get for games these days. 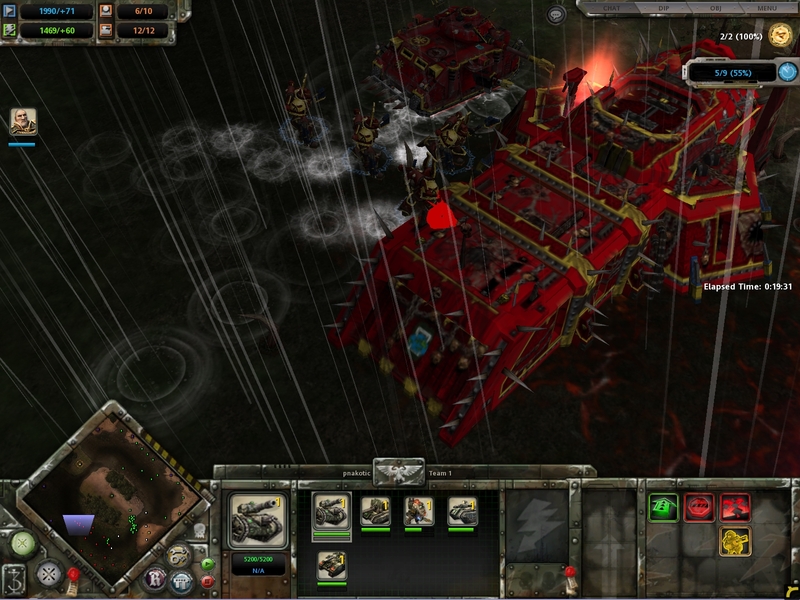 It completes Dawn of War, giving us the Imperial Guard to play and letting us play the other races in single player. The story, while enjoyable, really never goes anywhere. Dawn of War is about the Blood Ravens, and this story doesn’t deal with them. 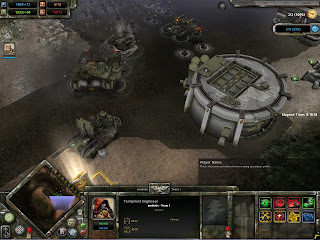 Not only that, but where in the first Dawn of War game there is character development with Gabriel Angelos having to come to terms with his Order Exterminatus on Cyrene, as well as lose his friend to Chaos, deal with the Inquisition, and fight a war, Winter Assault just has a bunch of factions fighting for a Titan. And yes, that Titan is a blast and a half to play, but in the end the big thing about the story is the set up of the Necrons in Dark Crusade. Of course, all this aside, the game is still worth playing. After all I still have friends that I play Dawn of War with, and it just wouldn’t be the same without the Imperial Guard as a playable faction.